Delivery of goods to Russia - it is not so simple as it might seem at first glance. When sending and delivery of goods is important to calculate the optimal route, to ensure safety of the cargo, and sometimes create certain conditions, in view of some of the features of specific products. In addition, delivery of cargo in Russia, due to the vastness of the territorial, can be carried out by various modes of transport: air, sea, road, rail, and sometimes combine them with each other. Note that if a person is an urgent need to get to any remote location, the most commonly used aircraft. But with the goods, the situation is somewhat different. Due to the fact that air freight quite expensive, it is usually when you need urgent delivery of goods to Russia, use the road and rail. Punctuality, thanks to strict adherence to the schedule. High reliability. According to statistics, the accident at the w / e ways, breakdowns on trains occur much less frequently than anywhere else. With the help of postal vans on passenger trains. With the help of postal vans on the fast trains. With the use of freight trains in covered or open wagons. With tanks, platforms and containers on freight trains. Most modern and most efficient way to deliver cargo is container transportation. The main advantage of this method is the most time-saving, due to the lack of need for transhipment of goods. Container transportation is one of the foundations of multimodal transport, where one route of the load changes several modes of transport. At the cost of delivery a lot of factors is reflected in Russia and first of all it depends on the type of transport used and the route distance. Calculation of delivery of cargo is usually not difficult to make. To do this, you need to know the approximate mileage between the origin and destination and the weight of the load. Note that also affects the urgency of delivery cost. In addition, the calculation of delivery need to be taken into account and the cost of forwarding services. Our company is engaged in the delivery of goods across the territory of the Russian Federation, any mode of transport. The specialists of "Customs Brokers Association," will help you choose the best route, determine the mode of transport. We can help you save money, for example, if you have a small batch of goods to be delivered to its destination, our staff, most likely offer you a delivery of modular, or, in other words, the consolidated cargoes. 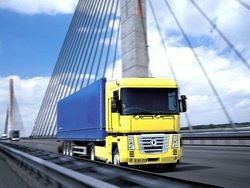 Our experts will help you to properly prepare all the supporting documents, and in case of necessity or desire of the client to insure the cargo. Accumulated over many years of experience allows us to properly organize transportation of oversized cargo. And in this case is extremely important teamwork of all participants in the delivery process: from office experts on logistics and ending with the drivers and loaders. Thanks to the well established work with state structures, our experts can agree with cargo traffic along the route. With us safe, because we arrange dispatch delivery support and continuously monitor the location of the cargo. The professional staff of our company is always at your service! We will promptly deliver your cargo to anywhere in Russia.